ST. LOUIS -- Every spring when the Busch Stadium grounds crew pulls back the tarp for the first time, a rabbit hops out. Now, in early October, it is looking for a squirrel. As Game 5 of the National League Division Series heads to Philadelphia, where is the squirrel that appeared on the field in St. Louis? 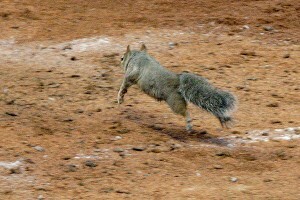 AP Photo/Tom Gannam The Busch Stadium "Rally Squirrel", who appeared this week at a couple of games, is still on the loose. Roy Oswalt was making his delivery to the plate in the fifth inning of Game 4 when his keen eyesight saw a squirrel running across the field. This was the second appearance in two days for the now famous squirrel. "We just started seeing them," said head groundskeeper Bill Findley, who is unsure whether it is just one squirrel or several. "The first sighting we saw was Monday, and we didn't think anything of it. Squirrel? Big deal. Once the crowd comes in, he'll run off. But apparently not. Apparently the crowd fired him up." The grounds crew has the field covered with seven humane squirrel traps, but so far, the squirrel has eluded them. Monday was the best chance for a squirrel capture when Findley's assistant saw the rodent burying a peanut in the outfield grass. "He dug out the sand," Findley said, "put the peanut in and actually took the grass clippings and covered it back up." The stadium squirrel, called the Busch Stadium rally squirrel, has its own Twitter account, gaining more than 10,000 followers in 24 hours. As the series moves to Citizens Bank Ballpark for Friday's game, one concern is whether the squirrel made the flight. Findley said the squirrel was never spotted in the locker room trying to hide in one of the ballplayer's bags. "He's a bleacher bum," Findley said.